The Readware Institute has been studying the nature of human knowledge for three decades. After much research, discovery, development, and validation , and several peer-reviewed academic publications , we now know that human knowledge is based on language processing. The words of human language point our subconscious minds through their sounds (phonemes) to abstract algorithms. During the human creative process (thinking, research, management, construction, and discovery), these abstract algorithms are involuntarily translated into concrete algorithms (practical methods) under spiritual guidance . We call this theory Deep Semantics . Readware is the implementation of Deep Semantics using Readware Tools . We use these tools to create analytical techniques, new scientific theories, management methods, and educational techniques. We have shown that human creative processes--which are usually involuntary and subconscious--can be induced consciously through the use of Readware Tools. The following figures demonstrate Deep Semantics. 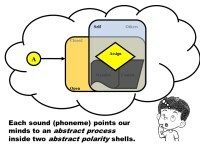 Each sound (phoneme) points our subconscious minds to an abstract process that can take place inside two abstract polarity shells. The involuntary human creative process subconsciously translates abstract processes and polarities into different concrete realizations to choose from. Our adopted spiritual superpower (figure in Theory section ) guides our minds in making these choices. The last figure illustrates how sounds jointly point to an abstract algorithm where one abstract process plays the role of a controller that manages the other abstract processes. The figure illustrates the Deep Semantics of the Arabic word root "AMN" (trust). To trust is to adopt a positive attitude when faced with uncertain information. 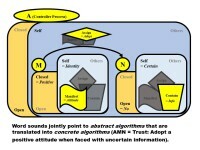 "A" points to the controller process (abstract name: open-self assign, concrete translation: adopt). This process manages the interaction between process "M" (abstract name: closed-self manifest, concrete translation: positive attitude) and process "N" (abstract name: open-self contain, concrete translation: uncertain information).